Greta is at that magic age, where she is actually capable of helping out in the kitchen–washing the grapes and picking them off the stems, making her own peanut butter banana, helping Chris by dumping ingredients into the bowl, and her current favorite (that takes place in the kitchen sink) is helping with Faye’s bath. Even though she is a tall girl and getting more capable by the day, she still needed to drag a dining room chair into the kitchen constantly–which definitely crowded things. Chris and I came up with a plan to make her a little step stool (inspired by this one) and it turned out beautifully! NOTE: The wood can be any species you like. Because this stool is for Greta, we went with pine. It’s soft, and easy to work with, but not as strong as other wood species. 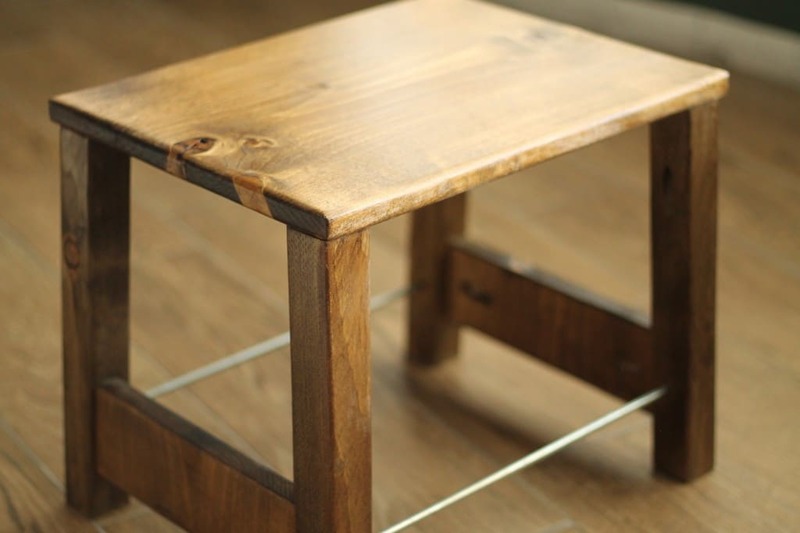 If the stool will be used by adults, buy a stronger wood like oak or something. • Stain and sealer, if you want. We used Provincial stain and satin Polycrylic to seal. End Result: 4 legs cut from the 2×2 board, each 12 inches long and cut at an angle of 5 degrees. – Our inspiration stool, the tops and bottoms of the legs are cut at an angle. Not only that, but the angle is from corner to corner, as opposed to a flat edge to a flat edge. This means the 2×2’s needed to be set on an edge before cutting, and this is pretty precarious. Now, I’m sure someone somewhere makes a brace to hold a piece of wood on an edge like that while you’re cutting it, but I wouldn’t even know what to search for in looking for one (Googling “brace to hold a piece of wood on an edge while cutting” didn’t pan out – weird, I know). So I just held it at an angle and eyeballed it. Turned out fine. You just need to make sure and cut both the top and bottom of the leg pieces (each leg being 12 inches long) at a 5 degree angle with a miter saw. Any steeper than that and the legs might stick out from the side too much and break. Also, make sure the angle on the top and bottom of the legs is oriented the same direction, otherwise it won’t sit right. – Sand each leg with the palm sander until smooth. End Result: 1 top piece cut form the 1×12 with dimensions of 11×15 (though the wood is called a “1×12,” the actual width of the board is closer to 11 inches, thus the dimensions are only 11×15). – Using your pencil, measuring tape and straight edge, make a line 15 inches from the edge of the 1×12 board. Using a circular or table saw, cut the board along the line. – Sand the 11×15 piece until smooth, taking time to round the edges to your desired roundness. – Using your Dremel tool or whatever metal-cutting thing you’re using, cut two 13.5 inch lengths out of the 3 ft rod. End Result: 2 wood supports cut from the 1×12 with dimensions of 3×11. – Using your pencil, measuring tape and straight edge, make a line 3 inches from the edge of the 1×12 board. Using a circular or table saw, cut the board along the line. Repeat the process so you have 2 sections of board with dimensions of 3×11. – Don’t sand these boards yet. – Following the directions that come with the Kreg pocket hole kit, drill 1 hole in each of the legs so they can be connected to the top piece. Take care to drill the hole in a side that will not be facing out once the stool is assembled. – Drill holes halfway through each leg for the metal rods, 3 inches from the bottom, directly in the middle. It can be really easy to drill a hole in the wrong side of the leg, so I found that it helps to lay the top piece down on your workbench so the underside is facing up, then set the legs in place where they will eventually be screwed into (about 1/4-1/2 inch from the corner edges – your call). Once in place, just make a quick mark on the side of the legs that needs to be drilled. 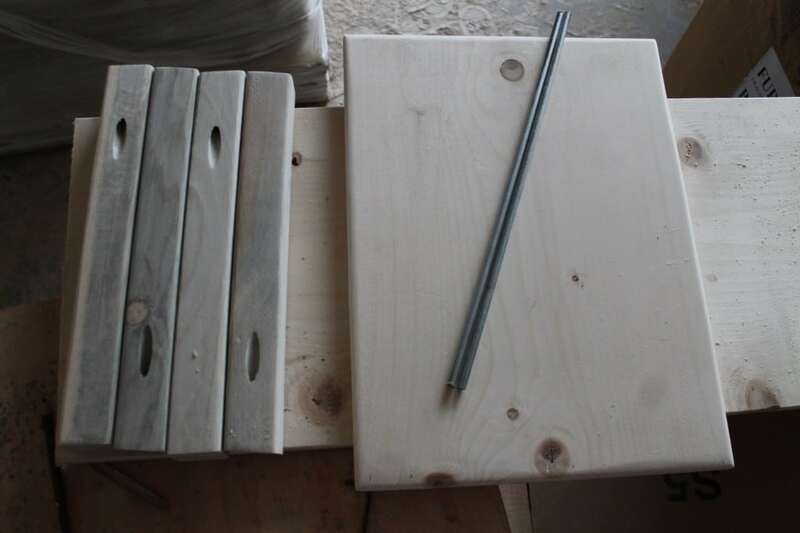 – Once the holes are drilled, put the rod into the holes and set the legs in place on the top piece, just to make sure you did it correctly and they are spaced appropriately. Drill a little further into the hole if needed, but be careful not to break through the other side. – Set the legs in place and carefully screw each in using one screw and a drill. Over-tightening could split the wood in this step, which is why we loved this Autosense Driver from Black+Decker. It stopped automatically saving us the headache. The above photo was taken right before Chris added on the side supports. You can see he had the pieces cut to also add an apron, but we decided we liked it even better without those. End Result: 3×11 Cross pieces will be cut to fit their spaces properly. – I’ll try to explain the way I did this part, and hopefully it isn’t confusing. I forgot to take a picture, so my apologies. But the easiest way to do this is to lay one of the corner pieces down on your work table, then set two legs of the stool on top of the piece so that the bottom of the cross piece is 1.5 inches up from the bottom of the legs (the pieces will sit between the legs perpendicular to the metal bars). Then, using the legs as a stencil of sorts, draw a line on the cross piece so you know how much to cut off and at what angle exactly. Did that make sense? Do this with both cross pieces. 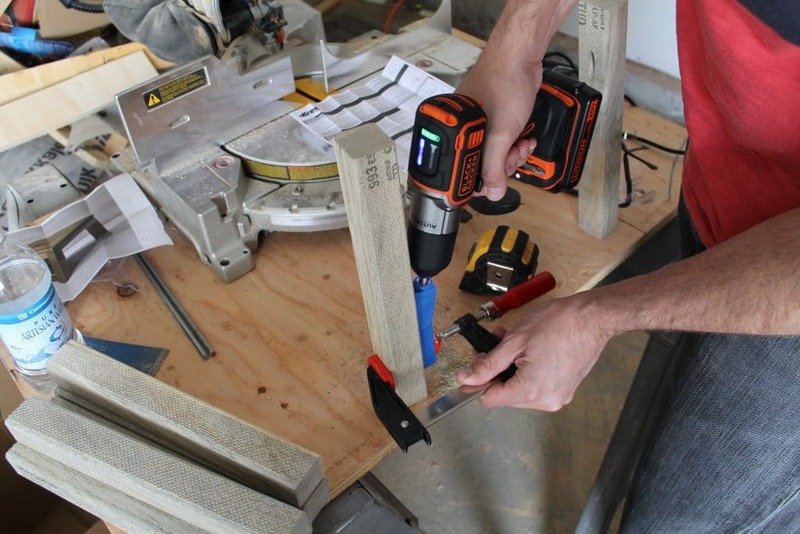 – Using the miter saw, cut where your lines are. – Following the directions that come with the Kreg pocket hole kit, drill 1 hole (or two if you prefer, to prevent the chance of the cross pieces spinning) in each side of the cross pieces so they can be connected to the legs. Take care to drill the holes in the side that will not be facing out once the stool is assembled. – Sand the top and bottom edges of the cross pieces until slightly rounded, leaving the sides that will be connected to the legs squared. 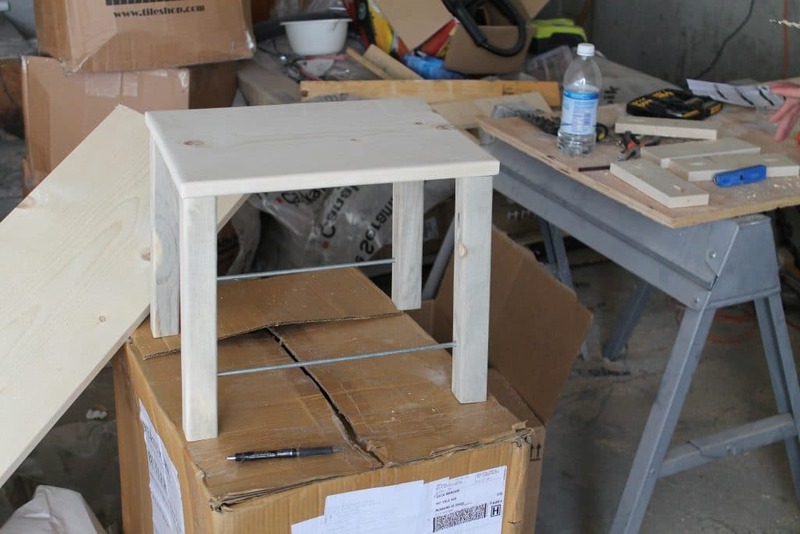 End Result: You’ll have successfully built a friggen stool. Mazel tov. – Line each cross piece up between the legs, perpendicular to the metal rods, with the bottoms of the cross pieces 1.5 inches up from the bottom of the legs. Screw the cross pieces in with a drill. (Jules here! )I took over from this point and stained the whole thing (minus the metal supports–love those!) Provincial–a favorite stain of mine. And after letting it dry overnight, I topped with two thin coats of Polycrylic sealer in satin. The classic stain with the natural knots exposed in the wood and metal rod details give this little step stool a warm industrial feeling. Like, maybe it’s been around for awhile and not that we made it in one evening in our garage a few days ago. Greta loves it. And we love that the kitchen is no longer crowded with a full sized chair. It stores perfectly in a nearby base cabinet, but is so pretty–we really like to just keep it out. Our friends at Black+Decker sent us their new 20V MAX* Lithium Cordless Drill/Driver with AutoSense Technology for this project, actually…they sent us TWO–one for you! The unique 20V MAX* Lithium Cordless Drill with AutoSense Technology has an automatic clutch that has proven to be three times more accurate than a mechanical clutch. You seriously have to watch the 60 second video here. It has so many features! We want you to see first hand how the Driver with AutoSense Technology stops itself when a screw is flush, and how the automatic clutch monitors the amount of torque needed to drive a screw–it’s all very life-changing for us DIYers, you know. So leave a comment telling us what you would make–maybe you are in need of a step stool, too?–and we’ll choose a random winner next Friday (June 27th). Thanks to BLACK+DECKER for sponsoring today’s post and allowing us to create original content. That little stool is so cute! I have a small folding 2 step stool that I keep in the kitchen cupboard for when I need to reach any top shelf in the house since we don’t really have space to keep a cute one like this out. That step stool would be handy to have here for my boys. Perhaps I could make that with a new drill! I would love a new drill! I have been wanting to make a DIY ottoman and the drill would come in oh so handy!! Love the stool too, it’s perfect. Though I do need a drill of my “own” I know a single mom of 3 that has done more projects than I could ever tackle that would benefit from a new drill. Pay it forward….. I think it’s great that Greta is helping out in the kitchen and that you’ve encouraged her by building this stool. The stool looks great, study and yet stylish enough for you to want to keep it out. I could certainly use a new drill to help me out with some home projects. Keep up the projects, both big and small. 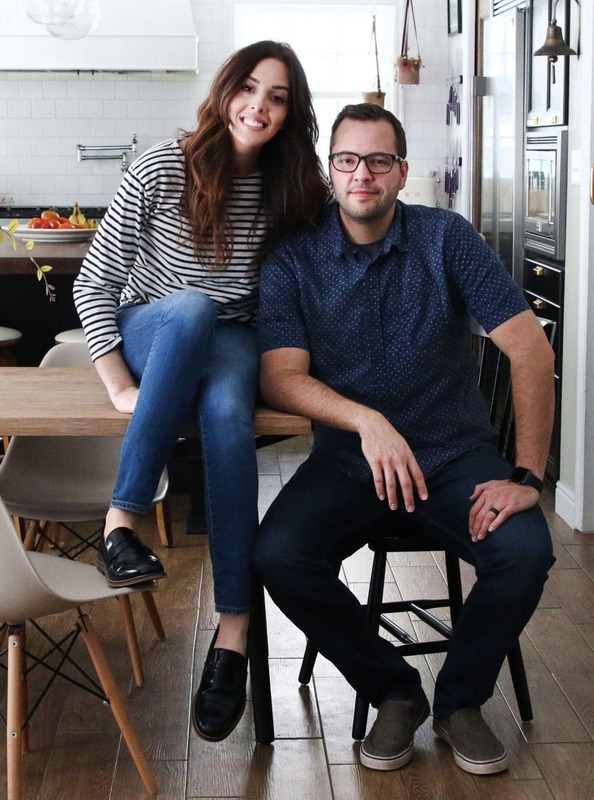 I love seeing the transformations to your home and am so glad that you’re taking the time to make changes that you both need and want. I would use it to build myself a kitchen island!! The step stool is beautiful! I would love to have one for myself being on the short side! I am itching to make a head board for our master, and a small bench for our tiny back porch. The Black & Decker drill would make both so much easier! I’d love to use a new drill to install shelves in our garage and hack an old dresser for the nurersy! I’d love to make a new rabbit hutch with my husband for our bunnies after we move to Virginia! They will be needing a little home of their own with our home. I’m rebuilding a poorly made fence soon! Oh my! I would love make two window planter boxes. Need to up our curb-appeal! Stools for me! My husband and boys are all way too tall. Our current electric drill is dying a sad and slow death. I got it in college – dad knew what his daughter needed. But I feel like at least 4 times a week I have a project that I use our drill on/need a better drill on :). My next project (hopefully) is building storage shelves under our stairs. We are planning to make a kitchen table this summer with a live wood edge to it. This would be awesome! Awesome! So pretty. I’d make a nightstand. We would love the deck to help building a new deck! would love to make a new step stool. Moving to a new house and would need one for the kitchen and to use on other projects. The step stool is great. Good job guys. I’d love to get started building some floating bookshelves for my son’s room. Thanks! Hi! We are another Chris and Julia!! I love your blog and style. We’ve referenced a few of your projects while working on our new home! We’d be excited to put a new drill to good use – starting with this stool! First off, longtime reader, but I don’t comment much. 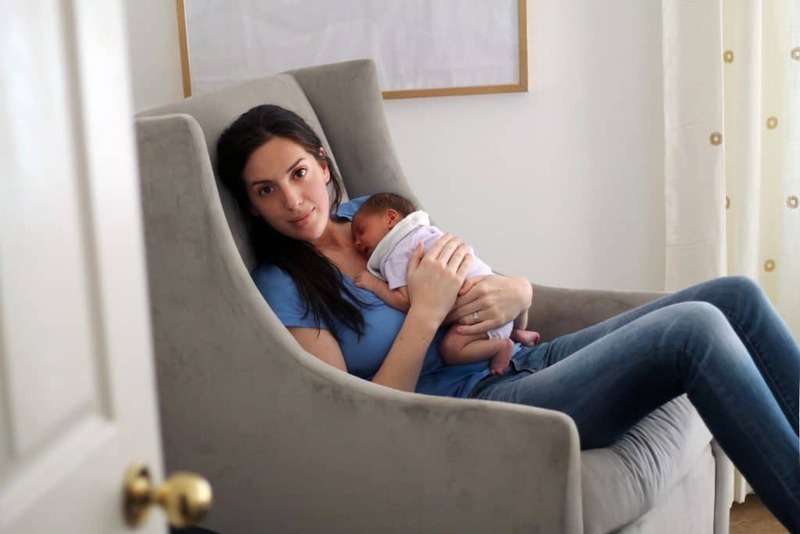 Love the blog and mazel tov back to you on your lovely children! thanks for the nice giveaway. Second, to answer your question: Shelves! We’ve just bought a house and need to install shelving roughly everywhere. No built-in storage! Umm… everything! We just bought a early ’80s split level and there is soooo much to do! I’d love help making a kitchen table! Buying a house… lot’s of projects!! 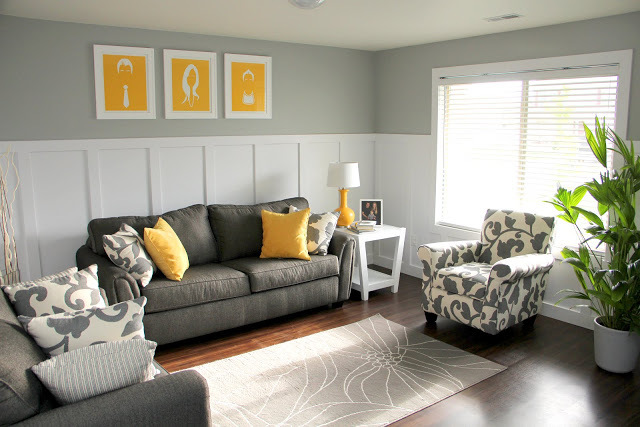 Can’t wait to get started on all of them, this drill would come in handy for the trim work throughout, shelving in the school room and sitting room, kitchen reno… and so much more! We’re just starting renovations on our basement so I’m sure we could make use of this drill many times over during that major project! I could also use this step stool tutorial for my short mom! She can’t even reach the middle shelves in the cabinets easily! We would make a headboard for our bed, a shelf for our living room wall (it’s so bare! ), and a new play area for our African Gray parrot, Omara. We badly need a new fence and this would come in handy for that project. We just bought a new house so this will come in handy for our renovations! We’re wanting to build an industrial bed frame. The drill would come in handy! We really need a new dining room table and I found a tutorial for a table that I love, but we don’t quite have all the tools to make it. A new drill would be awesome! I would love to make a coffee table to replace the $ 15 Ikea Lack that we have.. some grown up furniture ! I would make a little table for my daughter. We have two kiddie chairs, and now need a table to go with it! Cute stool! I love the metal rod detail. I need that B+D drill! Getting ready to build a ladder for our kids’ loft. It would be so cool to use an awesome tool to do it! What wouldn’t I do with it?! It looks amazing! I think I hear an outdoor side table calling my name. 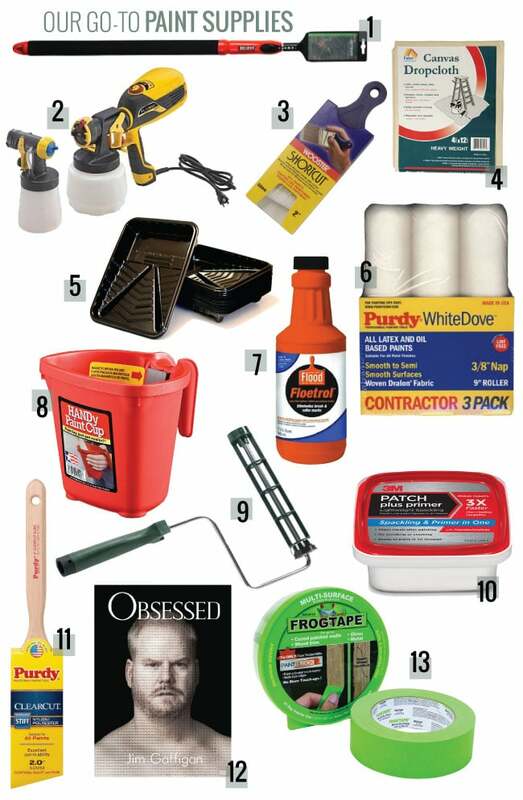 I have no idea what we would use it for first…we always have so many diy projects going. I’ve wanted a headboard for a loooong time!! We are planning to build some new shelving for the nursery and we desperately need to build a closet organizer. This would make life much easier! I need to make frames for the bathroom mirrors. Would love this!! I would try the step stool! I love it. I’m about to start on our wall mounted bedside tables and this would be so useful! I would make a headboard! I haven’t had a headboard since high school when I lived with my parents, nearly 20 years ago! I would make a console table. or a bench for the deck… So many projects in mind! Thanks for the opportunity! A new drill/driver like this would make assembling the cabinets in our kitchen remodel later this summer a breeze! I’d love to use the drill to build shelves in my son’s closet. The clothes and toys are out of control! A stool!! Im in desperate need of a cute one. I’m moving to a new apartment soon and am looking to build a built-in closet or at least some better storage solutions! I would use it to put together our new patio furniture and help my brother install crown molding! Then I’d basically claim it as my own rather than having to continually borrow my husbands! I love this stepstool! I’d love to use the same plans for some small outdoor patio tables! We just bought our first house – a farmhouse built in 1900! It’s a project house for sure – we are so excited to transform it & restore its original beauty! 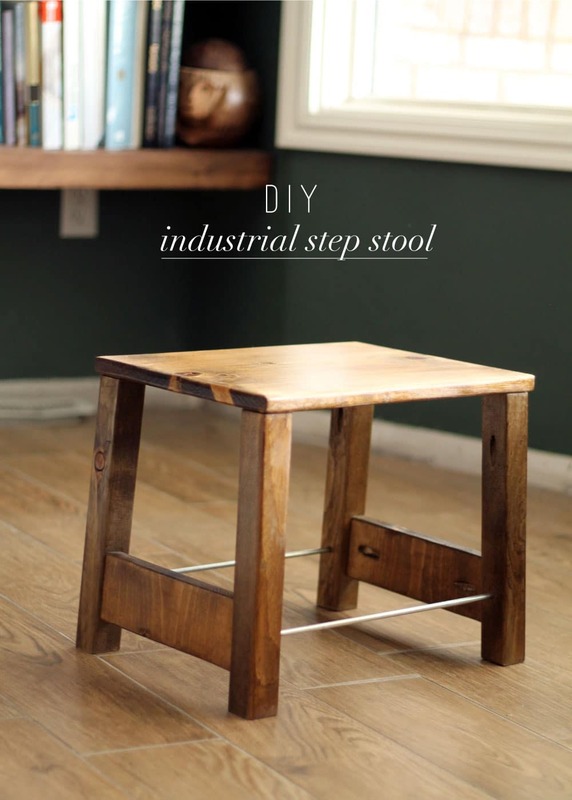 I’d like to try to make your industrial step stool and maybe some shelves too! we moved to a new place a few months back and STILL haven’t hung any of our art or shelves up! the cordless drill we have now holds a charge for like.. 5 minutes and isn’t strong enough to go into studs ugh! I really need this tool! We are expecting our first baby and have so many handmade projects in mind. We are building a full wall built in storage with a window seat, redoing the shelving in an old armoir, and making book ledges. So much to build and so little time! Our drill is okay but about 25 years old and was a hand me down from my husband’s grandfather. It is heavy and messes up quite a bit, but it can get the job done. Man would a tool like this make all the difference, but we definitely do not have the budget for it with a baby on the way! Looks good! I would love to make a headboard or a side table with a swivel top for my laptop! I want to make some pot stools. I have a bunch of pots outside with flowers and I think they’ll look better a little bit off the ground. A drill would really help with it. We just bought a new house and move in June 27th! This will be perfect for everything that needs to be assembeld & hung! I’d love to make a thin, long ledge for pictures to put in our hallway. I’m constantly rearranging frames and repairing holes is no fun. A ledge would give me the flexibility that I want. Definitely a stool like this. What a fabulous replacement for a kitchen chair all the time. Especially in my tiny kitchen! Love the stool! We just moved into our first house, and there are many projects on the horizon! First up: upgrading our basic hollow-core doors. Can’t wait! We are always working on our 100 year old craftsman house. We would use the drill for about a million different projects. First on the list, fixing the broken bathroom cabinet door, replacing a board on our deck, hanging new window treatments…..oh, and the list continues! I was about to start my shelves project around the fireplace and this tool would be purrrrrfect!! Love that step stool! If I win I may have to try it out! I would make all things! Really, I have a few cabinet projects in mind. I’d build a couple of those! I’m about to embark on an adventure: making an ottoman from scratch. The drill would certainly make the creation of the base easier! I saw this wall-hanging teacup rack thing on Pinterest, it has hooks to hang your mugs and stuff in the kitchen? I have a huge mug collection and I’ve been begging Dave to make it for me. So if I won this I’d be like, hey I won you this drill, now use it to make this for me! …because I’m a nice wife like that. Love that step stool! It looks nice! My hubs and I have been building tables lately, it’d be so nice to have my own drill to use to help him! We actually do need a step stool for our 4 year old! Thanks for the great post! I would have my husband make us a new farmhouse tabletop to replace the one we have the has a split board on it! It’s been on the to-do list for quite some time! I would make a new headboard and we are getting close to the step stool stage too! We need this very stool for our recently updated kitchen (painted the cabinets following your tutorials…thanks!). Of course, I’d also have to buy a table saw. Hmm…my birthday’s coming up…. By the way: Best line in this post (possibly best line of all time): “End result: You’ll have built a friggen step stool. Mazel tov,” I laughed out loud! I’ve been wanting to build a custom wine rack for a while, and this would come in handy! I would love that little stool! So cute! Would love one of these, but never wanted to spring for one. Thanks for the chance to win one! We need a new drill! – we have to keep stopping in the middle of projects to charge the battery on our old one. I am using a hand me down corded drill from the 60’s. It is heavy and leaks oil. I could really use a modern drill! Cute step stool I like the vintage industrial look! I am planning our DIY mini kitchen reno so this would come in handy. First up, open shelving. We have plans to build a set of toddler bunk beds and also a corner bookshelf in our living room! Having this drill would be AMAZING! So many things I would love to make with this! Really wanting to make an industrial coffee table for our basement! Maybe I can tweak this for that! I want to make a little stool for my daughter and this would be perfect! Just moved in to a new house and there are so many things to use this drill for but at the top of my list is getting closet organizers built and installed! My boyfriend and I just bought an apartment, and my mind is buzzing with the possibilities!! The end table I’m planning on building, custom shelves for the kitchen reno we are planning… oh man. Ryan got a drill a few years back for his bday and it loses power so quickly!! This would be a nice replacement! Oh man my son would love a step stool! He loves to help with everything from laundry to cooking to dishes. We’d make lots of things!! We’d probably first use it on our kitchen project to put our fresh painted cabinets back on. I’d also love to make a step stool!! With three tinies we are always having chairs moved around. I’d make a nightstand for our guest room! I’d definitely make a small table for my foyer! This would come in handy for any of the trillion things on our build list: patio table, bench for our dining table, deck expansion, bed frame, sofa table – oy, it’s never ending. I would make some night tables for our bedroom. No project yet, but I’m hoping to get a little house this year, and that tool will come in handy for sure! We’re in need of a coffee table, so this drill would be perfect! The stool looks great! Right now I would use the cordless drill to make picture frames and hang curtains. In the future, the possibilities are endless! We would make a train table for my son! He loves his trains, but I have an aversion to the premade Thomas themed ones, or even the train specific ones in general. I would rather make something sturdy that looks beautiful but can also transition into a Lego table, a GI Joe table, a dinosaur fight table…whatever he is into next! His birthday is in less than a month, so this would come at the perfect time! My husband and I are buying our first house! A fixer upper!! so the list of what I would make is endless . . . our first step is the floors and then the cabinets! I’d make a ladder-like stool that I could hang off of my kitchen cabinet lowers so that it’s handy and available when I need to get things on top of the cabinet uppers. 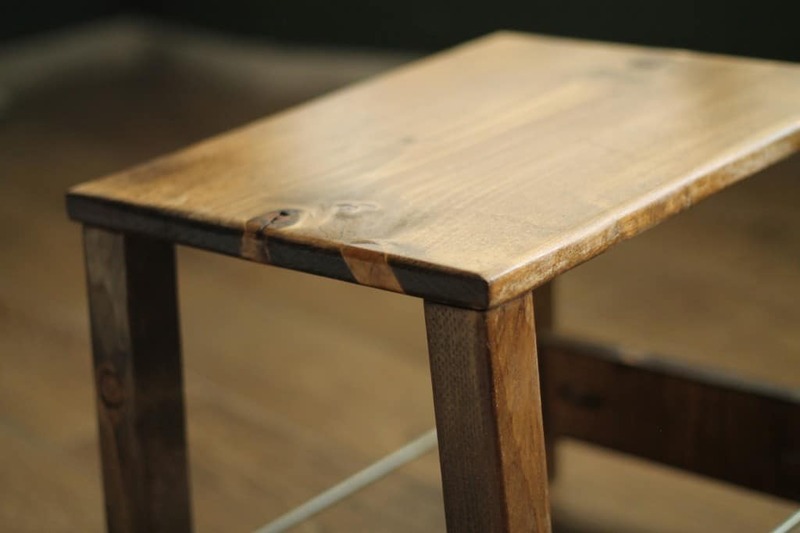 Nice staining on your stool – looks really well-finished. Love that stool. I would love to make either a similar stepstool for my daughter, or use it to make an outdoor loveseat for our deck. Right now we only have a bitsro set, and I’d really love something that our whole family could snuggle up on. I am SO in need of a step-stool since I’m only 4’9″. I can only reach the bottom shelf in our upper cabinets, forget the top two, there is no way! I was just in the market for a step stool for my two year old son, so this tutorial is perfect! We are in need of shelves in our storage room, it would be great to have a tool like this to get the project done in less time! I’d make a bunch of basic benches to give us some seating around the fire pit and use up the pile of scrap wood. I’d love to make a desk for my guestroom/office! That stool is fantastic! I would use the drill to make a bench in our new mudroom! Love this! I would make a bench fort kitchen entry. We’re working on a very large cork board (from actual wine corks) so this woulb be helpful building that frame. We could use a stepstool like yours. I also came across a tutorial for an improved closet door that would be awesome. Not in need of a stepping stool (although it looks fab! ), but I’m moving in with my boyfriend in September so it will come in handy for all the frames I want to hang :D. And the picture ledge I want to built (like the ones you had in your first house, I think that’s the first time I saw picture ledges, it was instant love!). It’s my first attempt to actually build something myself and not just put IKEA furniture together :). So this drill/screwdriver would come in handy (for the inevitable IKEA furniture too ;))! It would also be a nice graduating present. I’m dragging myself through my final examens (another week!!) before I graduate after 5 years on the 5th of July! I would make some custom shelves in our tiny bathroom: it has a corner cut out due to a nearby coat closet, and the space that’s left is just too short for purchased shelving to be any use at all. We are moving into a new house in July and my first project is to paint the kitchen cabinets. A drill would make it so much easier to remove the cabinet doors and hardware! No closet in our master bedroom means we are desperate for some storage. This would go a long way in helping us achieve some much needed clothes storage… and organization! 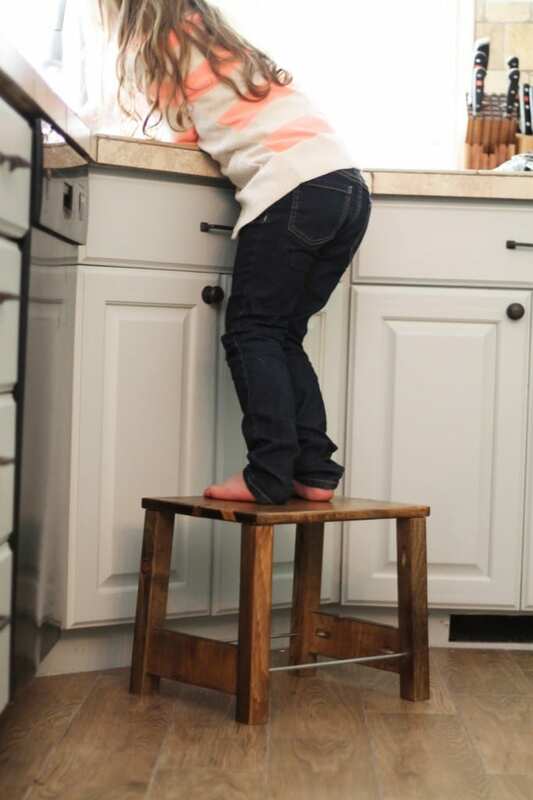 We actually need TWO stepstools… Our twin toddlers are always asking to help in the kitchen, and I have a little heart-attack every time I see them trying to climb our aluminum counter stools. This would be perfect! We need a new drill for basically everything– we close on our house next week!